London’s Paralympics have begun, and peoples from around the world have drained away from their home cities and headed for London, newly reappointed centre of the world. 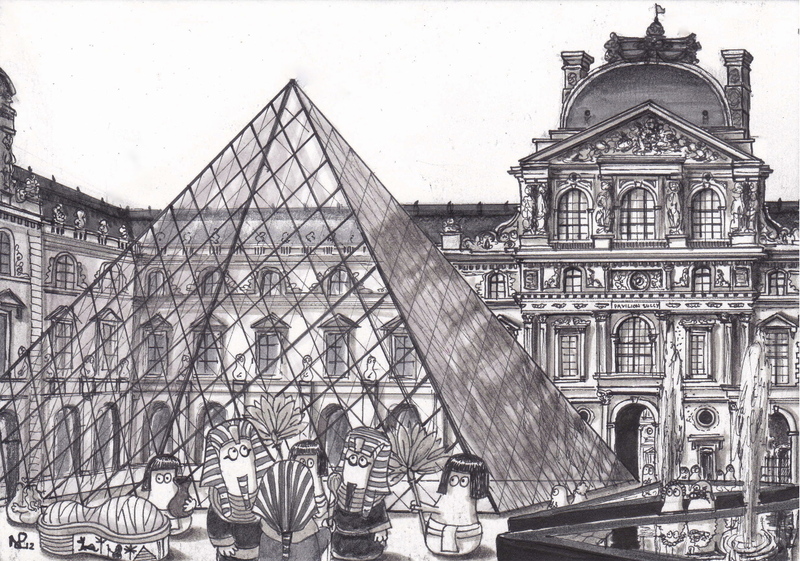 In fair Paris, with the August absence of the Parisians still conspicuous, and a raft of tourists headed North over La Manche, a group of strange looking Norms have taken advantage of the silence descending the city, and arrived at the famous Musée du Louvre in search of something which they think belongs to them. Attracted by the familiar shape of the Louvre’s huge glass pyramid, now the iconic symbol of a reimagined contemporary Louvre, designed by I M Pei, and made all the more famous by the conspiracy theories of Dan Brown, these Norms emerge from the ancient land of Egypt, brought back to life from deep within their gilded tombs in search of the historical artefacts ravaged from their burial places and placed in grand museums such as the Louvre. Yes, the Pharaoh Norms have returned to the Louvre, in search of their birthright heritage, and yet dragging with them a Mummy Norm, just in case they change their mind and decided to make a new donation to the French collection… (they’re rather capricious, these ancient Egypnorms). Here we join them as they formulate a strategy for their great heist of the Louvre’s Egyptology galleries. They’ve found the pyramid, but the glass has confused them. Is this witchcraft which has made the pyramid appear before them and yet not? There’s much to muse over in this brave new world around them. I think we’ll leave them to it.